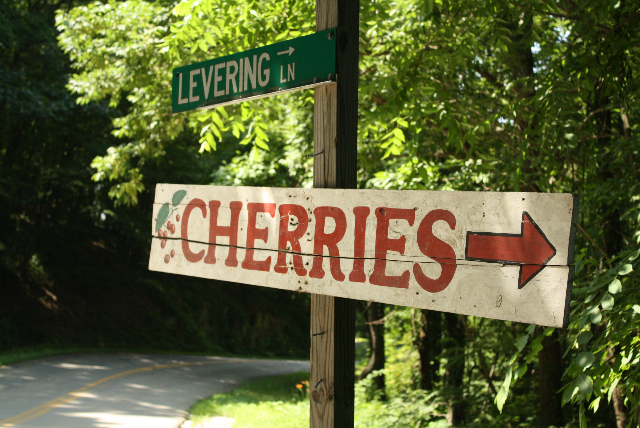 It’s cherry-picking time in Virginia’s Blue Ridge Mountains, a great time to drop in at Levering Orchard. The baked goods you’ll make with the cherries you don’t eat during the drive home will be fantastic. 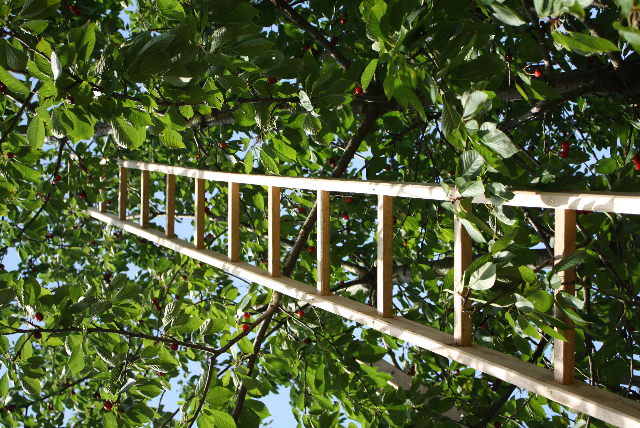 More than 150 tall wooden ladders let pickers reach cherries at Levering Orchard. 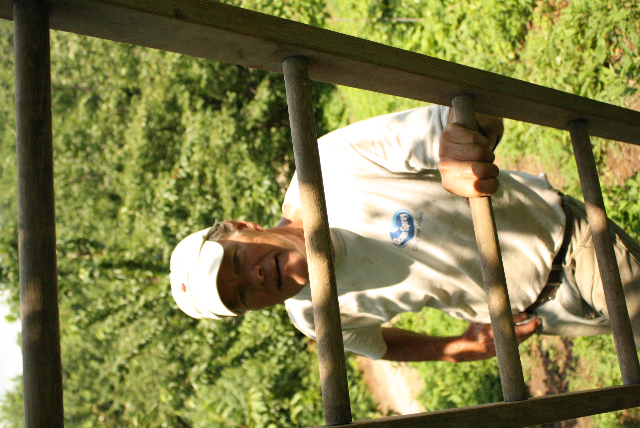 The first time I met Levering Orchard owner Frank Levering, he spoke eloquently about ladders. Frank has a special affinity for ladders. It doesn’t take long to figure out that Frank, who grew up in this scenic orchard just off the Blue Ridge Parkway where his parents and grandparents before him also tended the fruit as far back as 1908, is a poet and writer as well. As a younger man he took screenplay-writing ambitions to Hollywood and met moderate success. Even now that he’s been back home for nearly three decades and is well ensconced as an orchardist, he sometimes writes plays during the winter off-season and in late summer produces shows at a little outdoor stage on the steeply sloped property. I filled these buckets in about a half hour. 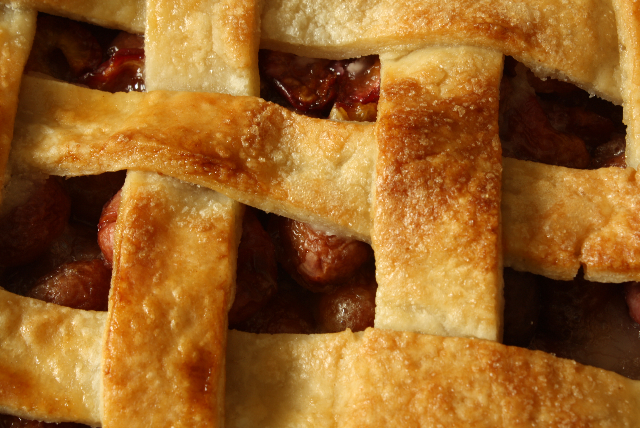 It’s a fact: Baking with cherries you picked yourself makes them taste better. Harvest some at this western Virginia orchard, and you’ll understand. 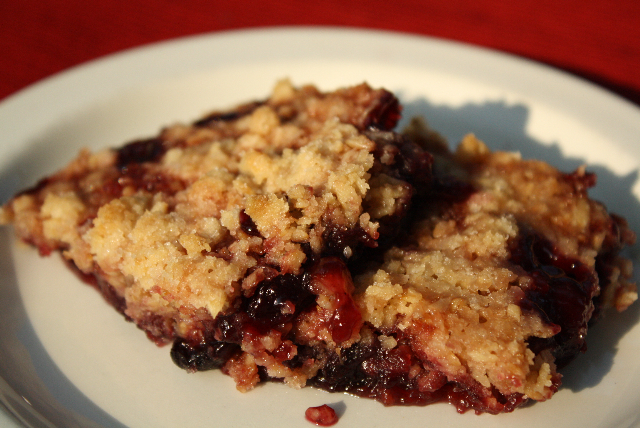 This recipe for Cherry Crisp went over very well at my house. My family quickly finished off the initial batch and clamored for more. I’d brought back plenty of cherries from my visit to the you-pick operation at Levering Orchard in Ararat, Virginia—more than we were likely to eat as raw snacks before they began to rot—so I gladly started in making a double batch. The second time around I had enough to satisfy the home front and share some with a neighbor. 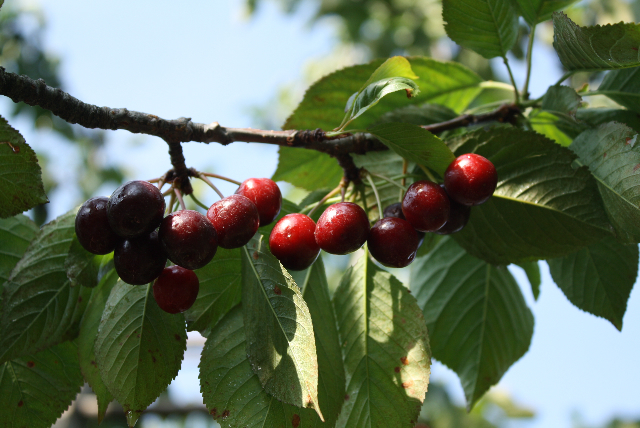 With delicious cherries in season, I head to Levering Orchard in western Virginia for pick-your-own fruit, a lovely outing in a beautiful setting, and cherry recipes to bake when I get home. 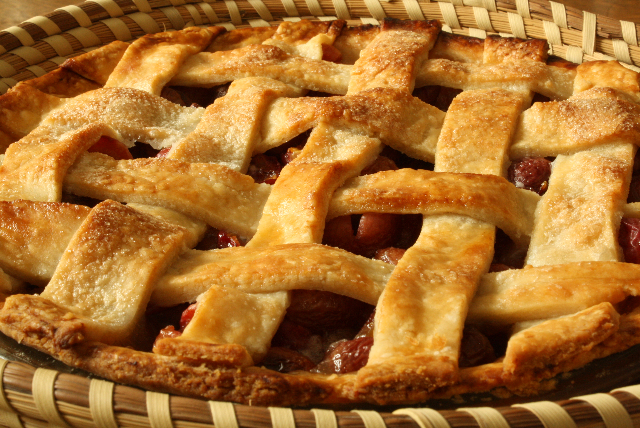 A day before I made this pie, the tart cherries I picked for it were still hanging on trees. I picked the cherries that went into the pie I’m eating as I write this. There’s a sense of accomplishment—and a certain smug pleasure—in this fact. Besides reveling in buckets full of fresh cherries to snack on raw and to bake into various treats, I also have fresh memories of spending a lovely day in a century-old orchard perched on a verdant slope of the Blue Ridge Mountains just off the road-trip-worthy Blue Ridge Parkway. 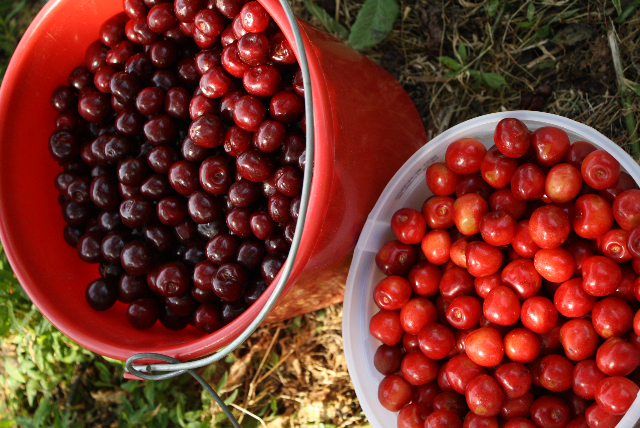 At Levering Orchard in western Virginia, the southernmost cherry orchard in the eastern United States, people can drive up, borrow plastic pales, climb wooden ladders already placed in ripe locations, and harvest as much fruit as they want (paying $2.49 per pound as they leave). Red and purple fingers belie the effort, and red and purple tongues offer evidence that sampling while picking is not only common but also encouraged. 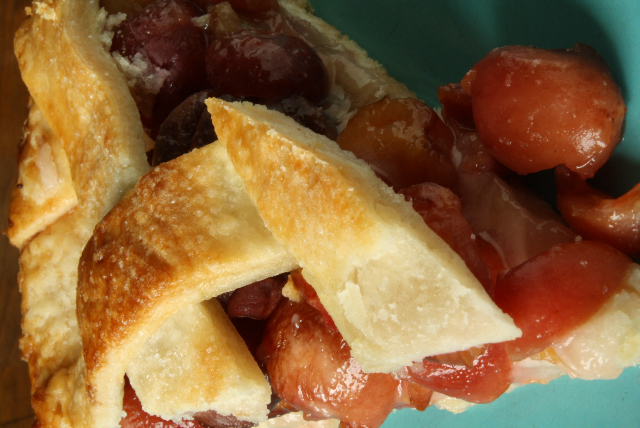 A sweet slice of homemade cherry pie, loaded with fruit as well as memories of a fine day of cherry picking. 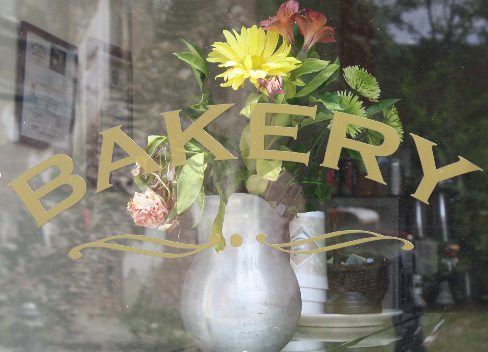 “People are always happy when they come into a bakery,” says Sonya Jones, explaining why she loves being a baker. 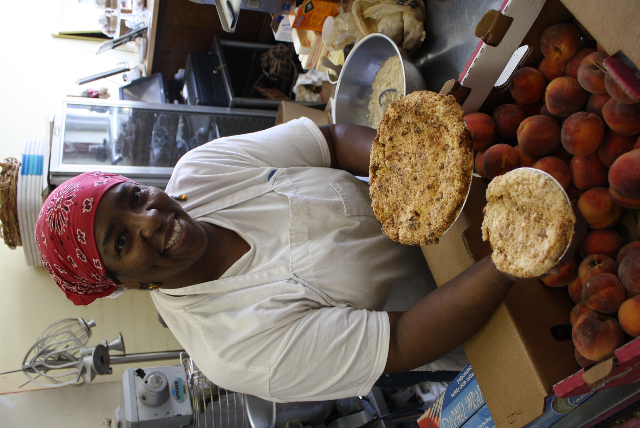 Sweet Auburn Bread Company owner Sonya Jones experiments with peach pies during a creative diversion from her usual focus of baking treats made from sweet potatoes. Peach cobbler, peach muffins, peach bread, peach ice cream, peach jelly-cake (a confection involving peach jam spread between cake layers), and other peachy goods fill the tiny workspace, with crates of fresh peaches still waiting to be converted into showpiece treats. Taste exceptional breads and show your support for artisan bakers during this widespread June 25 event. If you enjoy fresh-from-the-oven breads—crusty, aromatic, well-fermented, and hearth-baked by bakers who care dearly about making perfect loaves—then mark June 25 as a high holiday on your calendar. That’s the day the Bread Bakers Guild of America—an organization that fervently supports the artisan baking community everywhere—presents a massive International Bakery Open House involving 55 bakeries in 26 states, 2 Canadian provinces, and Ireland.